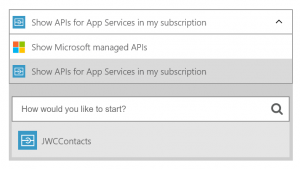 The latest release of the Logic Apps feature in Azure App Service includes the ability to discover the APIs that you already have in your subscription and treat them with a first-class user experience in the Logic Apps designer. When you add a new trigger or action in your designer, you will now see a drop-down menu where you can choose between the managed APIs and the APIs for apps that exist in your subscription. To get your APIs to show up here, make sure that you have included the URL to the swagger in the API definition property. Also make sure that Cross-Origin Resource Sharing (CORS) is enabled on the web app, API app, or mobile app. With a little configuration, you can even get your v1 API apps to show up in this list. Read the Accessing v1 APIs and BizTalk APIs from Logic Apps blog for more information.